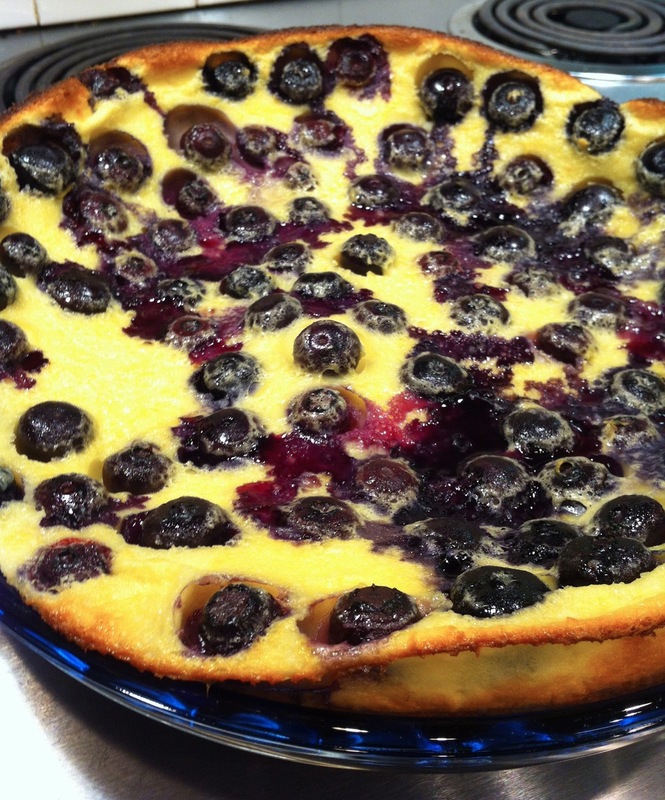 This is a French dessert traditionally made with cherries, but I think it’s even better with blueberries! And the lemon zest gives the custard great flavor. Ps – here is the pronunciation (I clearly couldn’t figure it out without a little help from Merriam-Webster). Using a hand mixer or a whisk, thoroughly combine the eggs, sugar, salt, and flour. Add the milk, lemon zest, lemon juice, and vanilla extract. Pour into a greased 9 inch pie plate. 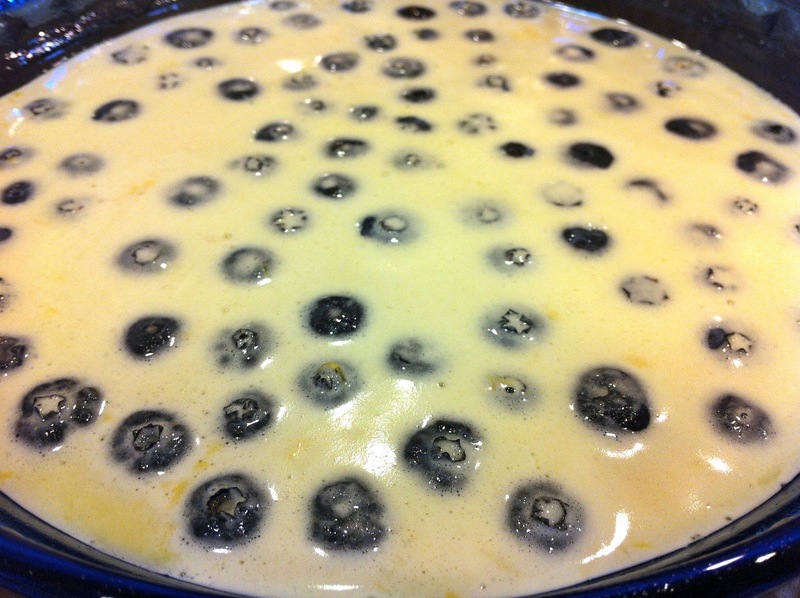 Sprinkle the blueberries on top. Bake for 40 minutes in a 350 oven. The batter puffs up while baking. Back in July of this year, I did my surgery rotation with some med students from other medical schools. One of these students was paired up with me on my surgical team. The lovely Anna (said student) from Jefferson recently shared with me this recipe and I had to replicate! She suggested that I make these muffins mini and she was right! They’re filled with mini chocolate chips so every single bite is absolutely peppered with chocolate and fresh banana flavors. If you’ve ever had a slice of Starbucks chocolate chip banana bread, this is reminiscent of those flavors but without the artificial banana aftertaste. I bet these would be awesome as a full banana bread loaf as well! Both my running buddy and my husband both immediately popped 3 or 4 into their mouths once they tried these. 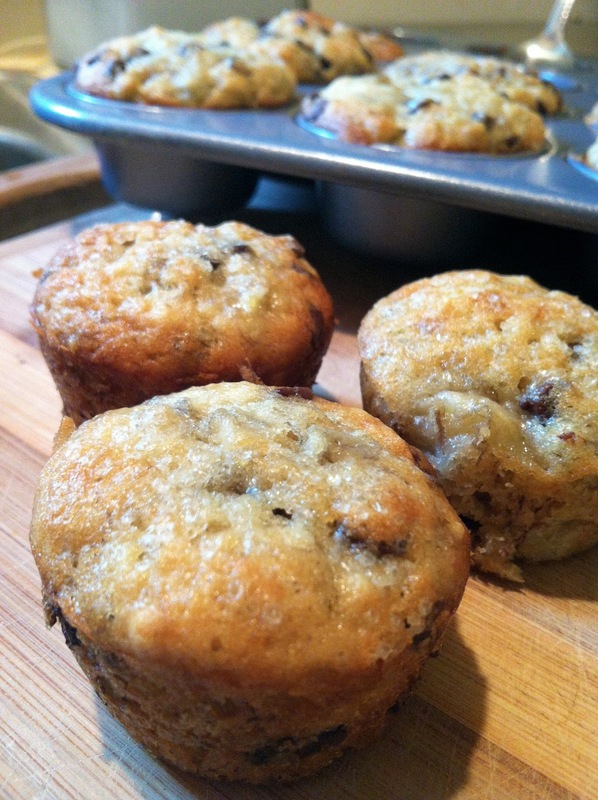 They’re super moist, chocolate-y and yet banana filled as well! I’ve got some people to thank for helping me with residency applications and I think these little guys will do just wonderfully in a thank you basket. Preheat your oven to 350 degrees and either line or spray your mini muffin tin with cooking spray. Mix together your flour, baking powder, baking soda and salt. In another bowl, mix together your smashed bananas, sugar, egg, vanilla, and melted butter. Slowly incorporate your flour mixture into this banana bowl until well incorporated. Fold in your mini chocolate chips until evenly dispersed. Fill your muffin tins about 3/4 full. I used a heaping, heaping tablespoon as a measurement and tried to keep the batter amounts relatively uniform from tin to tin. Bake for 16 minutes and let them cool before digging in. Or not…they’re yummy warm as well! Also, Anna told me that she added in walnuts to hers. I didn’t get a chance to do this but it sounds so good! I’m definitely going to be using this again in larger muffin or loaf pan form. Congratulations to the class of 2013! 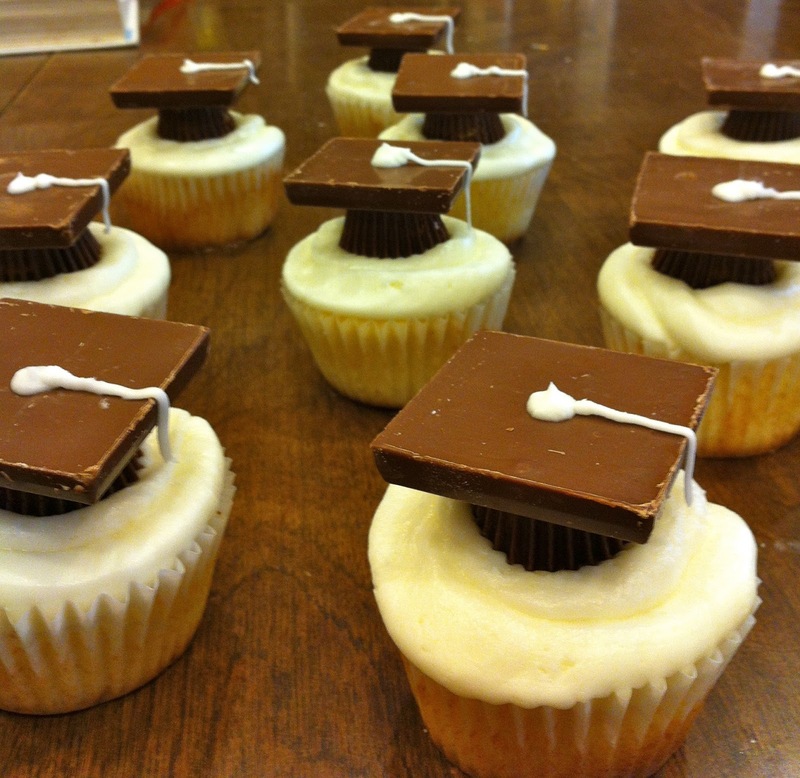 What better way to celebrate graduation than with cupcakes??? Preheat the oven to 375°F and line about 16 muffins tins with papers. Cream the butter and the sugar. Beat in the eggs, one at a time. Add the vanilla. Bake for 12 to 15 minutes or until a toothpick in the center comes out clean. 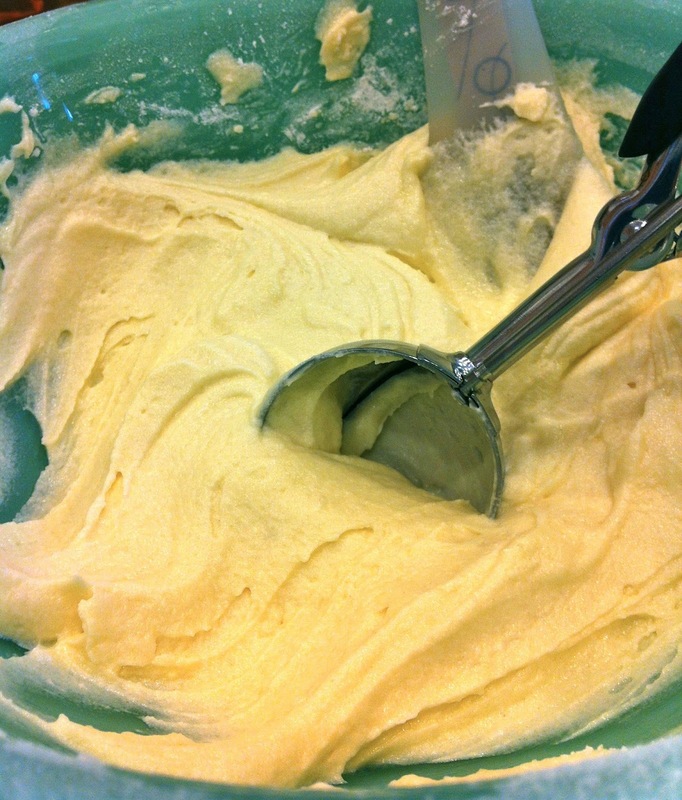 mmmmm cake batter…cookie scoops work really well when making cupcakes!!! Cream the butter. Gradually add in the powdered sugar, milk, and vanilla until you get a frosting consistency. Put some of the frosting in a Ziploc bag and pipe onto the cupcakes. Cut a fairly big corner into the corner to pipe through. 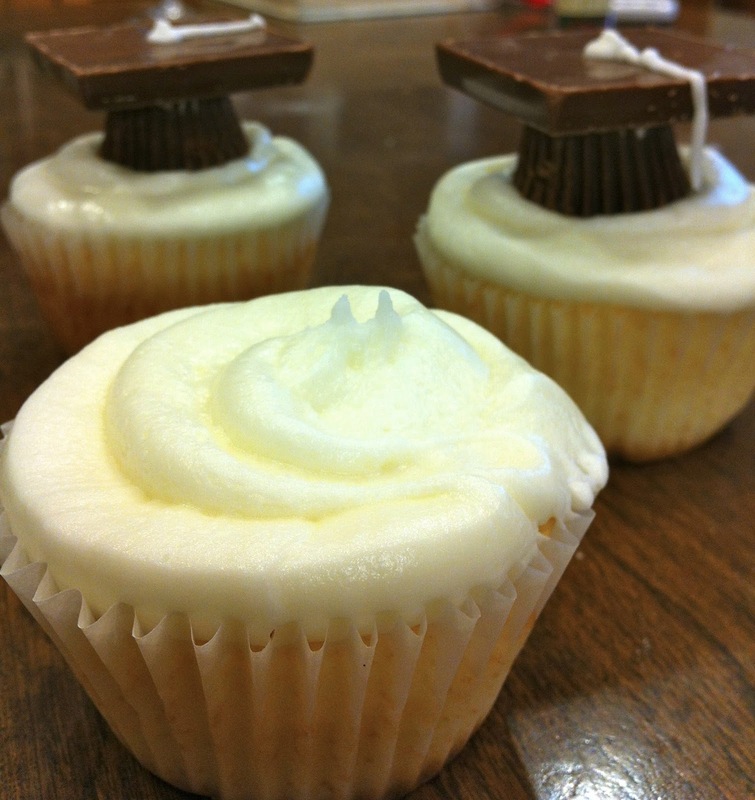 For the hats, put a dab of frosting on the bottom of a Reese cup and use this to glue it to the chocolate square. 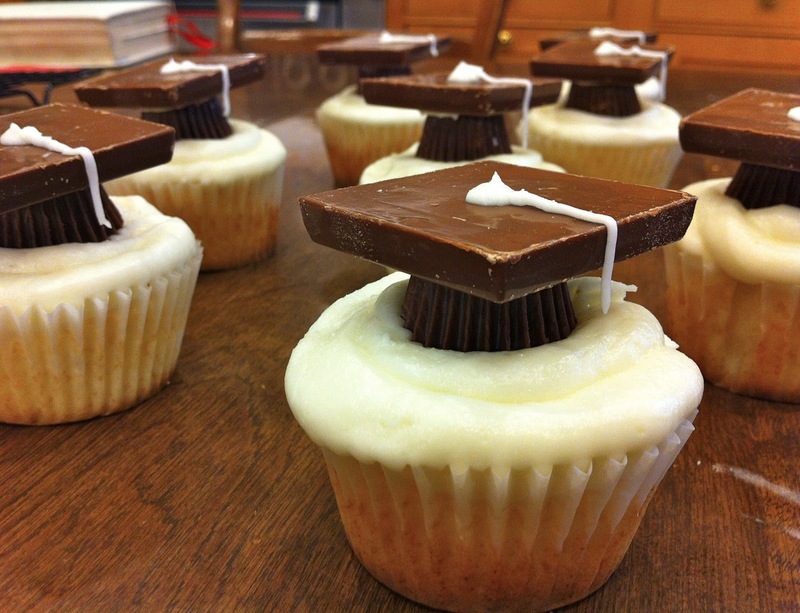 Use some frosting piped through a TINY hole cut in the corner of a Ziploc bag to fashion the tassel. Put the hat onto your cupcake! The graduates…they look so scholarly!